... accepting students of ensemble and auditors ! ... I have never done a guitar ensemble, but I want to do someday if it's some fun. ... Guitar ensemble, I've done by some crunchy experience, I mean I'm now doing! But even if only an experience with other ensemble, it'll be how nice. ... Wow, Guitar Ensemble? You know, I'm a conductor, and I've been a concert master in my guitar ensemble team. Hey, you're doing a new piece by Shingo? ... Did you say “Guitar Ensemble”? A Guitar Should be solo! The solo is absolutely interesting, and the ensemble is something boring. ... Guitar Ensemble, probably does not have any famous repertoire? It's boring, isn't it? Roughly, it's not what to study music. ... then, this is a big chance for you. We can say “Guitar Ensemble” is already the basis of guitar education in European and American music schools. 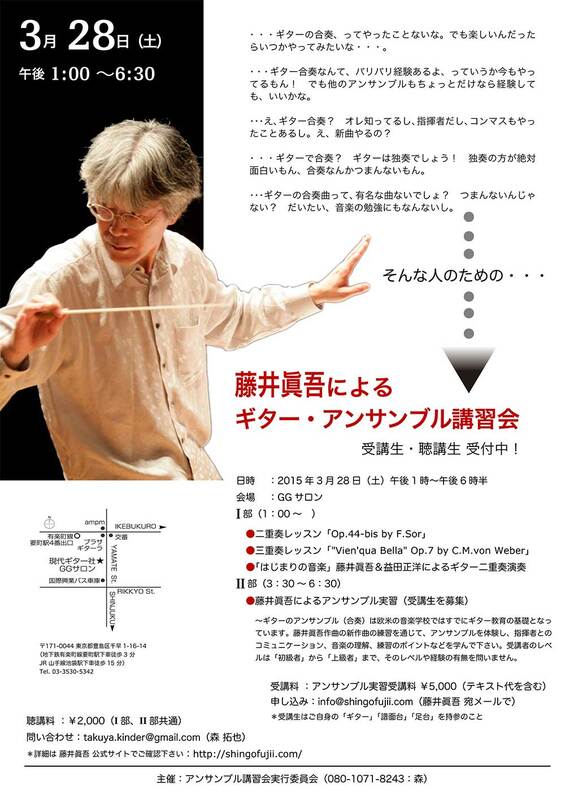 Through the practice of new composition by Shingo Fujii, experience the ensemble, and learn communication with the conductor, understanding of music, points of practice, etc. Level of students can be from "beginner" to "advanced". * students must attend to the class with own guitar, music stand and foot stool.